I find inspiration in very unexpected places. I am a fan of reading biographies/ essays/ articles of writers and their routines and habits but I get a little irritated at the self-help style of “How to Find Inspiration” articles. It’s like dating advice, what works for you will not necessarily work for others. We get so caught up in deadlines and the stress of the work and all of the “rules” that we think we ought to follow, we forget how to have fun. I think what’s important is to have fun. I tend to feel inspired while having fun. So no, this isn’t me telling you how to find inspiration. It’s just demonstrating that inspiration can be found maybe anywhere. I recently returned from my first time in San Francisco. My guide, someone who had lived there many years, took me through the various neighborhoods. I found the city very overwhelming and for a better part of the trip was trying to hold back a massive anxiety attack. There were two neighborhoods that didn’t feel claustrophobic to me, which I would love to go back and explore: Bernal Heights and the Castro. While walking through the Castro, my guide explained to me that we have to stop at a certain coffee place because, me being the coffee freak that I am, I would love it. Who knew that some of the city’s best coffee was to be found in a shared space with a Laundromat? And what better setting for a story? An eclectic coffee shop in a Laundromat. An awesome setting is in place. If you were writing that story, who would you want the first character to walk through that door to be? What would they order? Would they keep mistaking the large ceramic pit bull at the entrance for a real one like I did? Leaves whisper when they rustle. It’s the only sound as I glide across the bridge, cautious because of the rising heat. I’ve lost my companions and am low on rations. If I don’t find them soon, I’m afraid something bad will find me first and all will be lost. I’m moving towards a cluster of trees when I hear the roar. A burst of flames sends me diving behind the nearest boulder. A dragon! Before I can formulate the thought, a voice bursts through my fog and asks me what I will do next? I blink. What is happening here? My friend next to me is holding a rule book in one hand, and a fistful of dice in the other. Then I remember it’s a game; it’s not me but the role I’m playing in Dungeons and Dragons. My friend waits (rather impatiently) for my decision about what I intend to do. Slowly, straddling reality and the role I play, I role the die again. My hope is to use a stealth move to sneak past the dragon alive and find my other companions. My other companions in the game are my three other friends sitting around me in the room. It’s Saturday night and I am at a dive bar in Los Angeles. I am with my boyfriend and we are waiting for some friends to show up for a night of birthday drinking and karaoke. I love dive bars. The bar stools are red and cracked and you can tell this was the type of place that was once filled with cigarette smoke and regulars. The cigarette smoke is gone but the regulars are still here. After the bar is full and karaoke is in full swing, one woman in a green dress gets up and starts singing “Rock Lobster.” To say she’s into it is an understatement. She’s gyrating and dancing, hell—she’s interpretive dancing. Her singing is kind of an afterthought. She’s flapping her dress around, showing her underwear to the crowd while everyone, including me, screams the words along with her. While singing, I imagine who she is and what she’ll do the rest of the night, where she’ll go after she leaves, what her home will be like, what she’ll do to get ready for bed, and what she’ll do the next morning. Would she wake up with a hangover, regretting how much alcohol she drank and wondering if she made a fool of herself? Or would she meet up with friends and detail the awesome karaoke victory she had achieved? Either way, I’m inspired by her. 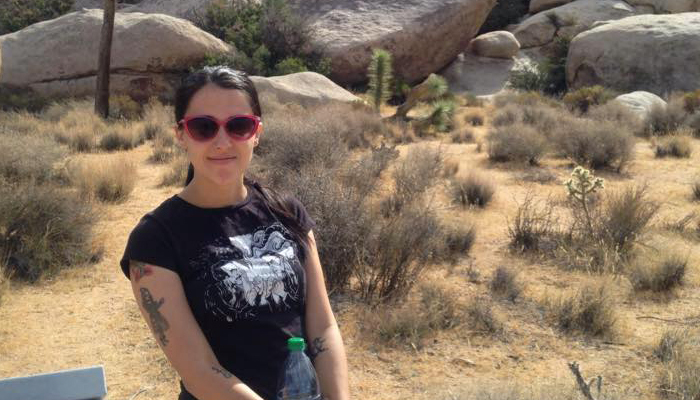 Ashley Perez holds an MFA in Creative Writing from Antioch University Los Angeles. She is a Rumpus intern and runs the literary blog, Arts Collide. Ashley’s work has appeared or is forthcoming in The Weekenders Magazine, BLEED, Drunk Monkeys, and the anthology, First Time: an Anthology about Lost Virginity. You can also find her on Twitter: @ArtsCollide.